It's already July and these longer, hotter days always cause me to crave dishes with fresh vegetables. Though munching on juicy berries and sweet watermelon is perfect for summertime snacking, something filling is needed by dinnertime. This penne recipe is by no means heavy as a creamy or meat sauce-laced pasta can be, but doesn't skimp on taste with plenty of parmesan and cauliflower caramelized by roasting. Basil, to me, is the taste of summer and whole leaves are thrown into this dish. 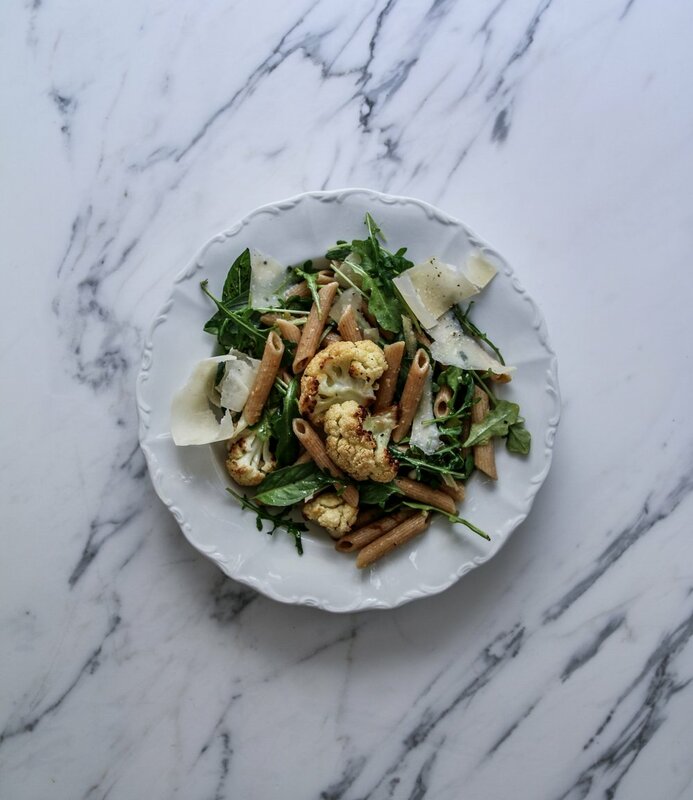 Arugula adds a fresh peppery flavor, to balance the plentitude of rich shaved parmesan. These are tossed in at the end, after dressing the pasta with olive oil along with lemon juice and zest. Though historically I haven't been the most fond of cauliflower, I was converted after trying a roasting method that allows the edges to become caramelized and almost crispy, a far cry from the raw or boiled versions. Be sure not to crowd the pan, giving each floret more than enough space between another, as this will help them roast rather than steam and become soft. *In order to roast the cauliflower well, be sure that the florets are as dry as possible. I tend to prefer to purchase pre-cut, pre-rinsed florets from the grocery store if I am planning to roast them as they are already quite dry. If you decide to use a head of cauliflower that has been rinsed, allow the cauliflower to dry on the countertop for a few hours. This helps the cauliflower to become browned and caramelized rather than steam due to the moisture. Toss the cauliflower florets in a bowl with olive oil, making sure that every part of each floret is well coated. Do not add salt at this time, as that can keep them from browning well. Place the florets on a baking sheet or roasting pan (my favorite roasting pan is this one), making sure that none are touching and they are sufficiently spaced, as this affects their browning as well. If they are bunched too close together, they will steam instead of caramelize as they roast. Place the cauliflower in the hot oven, and bake for 15 minutes, toss to evenly brown, then 15 minutes more. Set the roasted cauliflower aside. Bring a pot of salted water to a rolling boil. Add the pasta. While the pasta is cooking, heat a large dutch oven over medium heat. Add the unsalted butter, a few tablespoons of olive oil, and the minced garlic. Cook until the garlic is just beginning to brown, then add the cauliflower and toss with the buttery garlic. When the pasta is al dente, spoon into the dutch oven and toss with the cauliflower and garlic along with a few tablespoons of the pasta water. Take off the heat, and toss with the arugula and the zest of one lemon as well as a good squeeze of lemon juice (add to taste). Add salt and pepper to taste, and top with basil leaves and shaved parmesan. You may add an additional drizzle of olive oil if the pasta seems too dry.